Pumpkin and spice (it's everything nice!) - Stop staring and start sewing! I woke up to the sound of falling rain this morning and enjoyed a cozy, grey day. While that is ordinary for other cities, it's pretty darn extraordinary for Gilbert, Arizona. Fall has finally hit us and I celebrated by going up to Starbucks for a pumpkin scone (I love those things). I sat for a quiet hour of latte, scone, and Harry Potter (I'm on book 5, this is taking forever). Apparently it wasn't enough pumpkin for me and when I got home I explained to Sofia that she must find a pumpkin bread recipe and make some for me (and I wasn't going up to the store so she had to use what was on hand). She's such a compliant girl for being a 14 year old and she did a great job making these wonderful loaves (and the house smelled great!). Actually, it's easy for a teenager to be compliant when pumpkin bread is involved. So anyway, she used this recipe and doubled it (since I had a large can of pumpkin puree). I had her increase the spices by 50% which gave it more of that autumny flavor. She also increased the time by 10 minutes and it could've gone 10 minutes more actually (but that's one of those things you find out after cutting into the cooled bread). 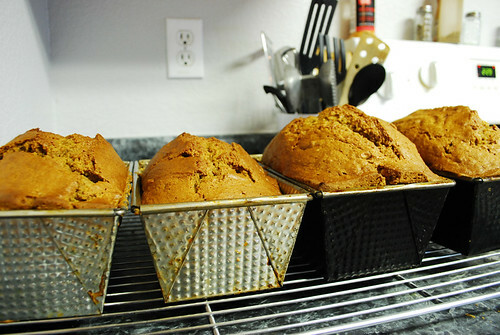 For some reason the 2 loaves that have walnuts ended up a lot taller than the others. Lovely. I've been doing oodles of re-organizing and ran into this unfinished project I'd started in the spring. They were supposed to be a Mother's Day gift for my mom but it looks like she'll be getting them for her birthday in December instead. 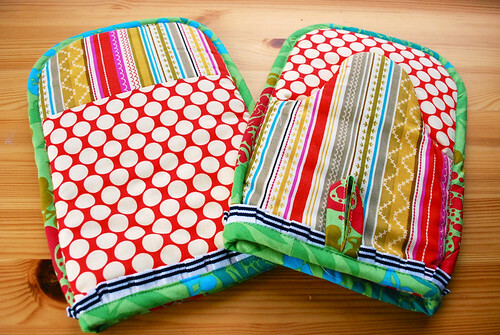 I really love this style of oven mitt and worked up this pattern myself. I think I'll narrow it a little next time but, other than them feeling a pinch too wide (for me anyway), I think they're perfect. 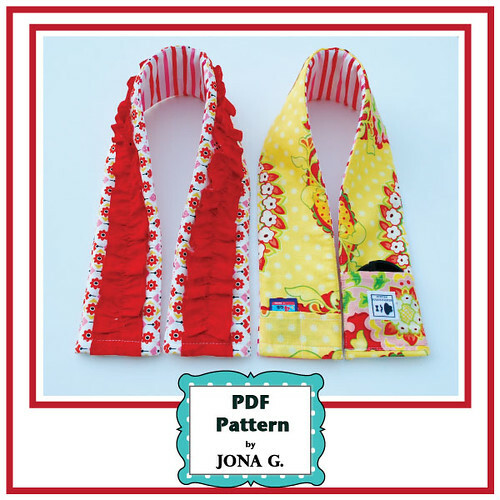 And I've just completed a new pdf pattern! This one was a lot of fun and was a fairly uncomplicated pattern to create (so it's only 5.00!). I love it because I was able to fit all the instructions on 4 black and white pages (but the cover has color) there's none of that cringing while your color ink budget is draining before your eyes. These make wonderful gifts and only require about 1/4 yard of fabric all together. Right now this pattern is in both of my etsy stores. And....if you've read down this far....I'm sending my new pattern free to the first 10 commenters! Go!